The periglomerular (PG) cells constitute a class of interneurons of the glomerular layer of the olfactory bulb (OB). They have small cell bodies and short spiny dendrites, which make reciprocal dendrodendritic synapses with primary dendrites of mitral and tufted (m/t) cells within glomeruli [1, 2]. The functional roles of PG cells are not known but their connectivity pattern suggest important functions for them in odor processing [3, 4]. This work describes a reduced compartmental, Hodgkin-Huxley type model of the PG cell. It was made to be embedded in an OB model, so it has specific compartments for synaptic inputs from olfactory receptor neurons and dendrodendritic synapses with m/t cells. The model was constructed using NEURON . It has a five-compartment structure, with a soma connected to two dendrites (primary and secondary) and an axon, with the primary dendrite having a spine connected to its distal end. The dimensions and passive membrane properties of the compartments were based on data from the literature [1, 2]. Six different ionic currents were used (the compartments in which they appear are within parentheses): Hodgkin-Huxley sodium and potassium (soma and axon), A-type inactivating current (soma, dendrites and spine), delayed rectifier potassium current (soma, dendrites and spine), hyperpolarization-activated current (soma, dendrites and spine) and low-threshold T-type calcium current (soma, dendrites and spine). The model also has a calcium diffusion mechanism in the soma, dendrites and spine. The maximal conductance densities were adjusted both manually and automatically using the Neurofitter package . An auto-inhibition was also implemented in the model via a graded GABAergic autosynapse in the spine. The model was submitted to simulated experiments that mimic experimental protocols  and reproduced the results well (see Figure 1, which should be compared with Figure 1C from ). This indicates that the model can be used in OB models. 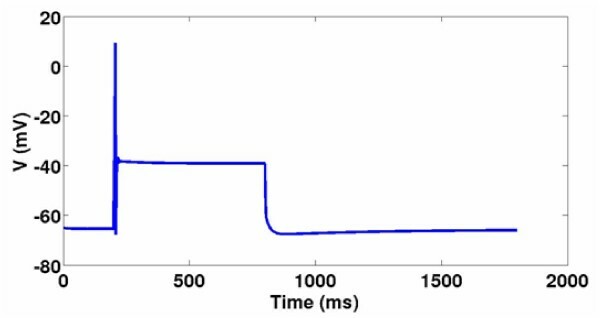 Response of the model to a current step of 0.1 nA applied with a 200 ms delay for a 600 ms duration. We would like to thank Michelle Lilith and the organizers of the Advanced Course in Computational Neuroscience, Arcachon, France, August 6–31 2007, where this work begun. ACR is supported by a research grant from CNPq.